If you have been following me for just about any amount of time, it’s pretty clear that I love historical mysteries. Obviously this is a huge genre with mystery novels coming out of every period to fit just about every interest. 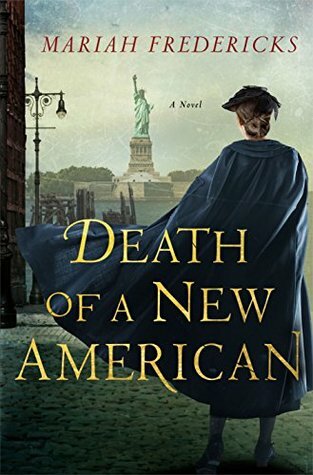 So when I am looking for a new historical mystery, I want to read something that is either ‘new’ or different, or has an outstanding main character that can relate to. When this series came up for review, I hadn’t heard a thing about it. In fact I was actually kind of surprised that I hadn’t heard anything about it since it’s set at the turn of the century which is one of my favorite historical mystery periods. The Tylers believe that this is an attempted kidnapping of their baby gone wrong; a warning from the criminal underworld to Charles Tyler. But Jane is asked to help with the investigation by her friend, journalist Michael Behan, who knows that she is uniquely placed to see what other tensions may simmer just below the surface in this wealthy, secretive household. Was Sofia’s murder fall-out from the social tensions rife in New York, or could it be a much more personal crime? (summary from Goodreads). So as I said, I am always looking for either new, refreshing approaches to historical mysteries, or I am looking for interesting characters. A lot of reviewers raved about Jane Prescott, especially after the first book in this series. So needless to say I was excited to see what all the fuss was about. Immediately I could tell that Jane was going to be a fun character who was easy to relate to and unique in her own way. She is a lady’s maid and I love that she is kind of an ‘ordinary’ girl. In so many mystery series, the protagonist is more from the posh set rather than a maid or another ordinary person in the household. I noticed some other reviewers pointed this aspect out and I think it’s important to note that many fans love that she is ‘normal’ rather than from the upper crush of society. While this is a second book in the series, I found it was easy to follow along with what was going on from the first book. The author gives you enough information to keep you in the loop, without giving away anything really from the first book. I also liked that this book explored some of the darker sides on American history, with gangs and mafia influence of this time period. I thought it was well researched historically and I loved that there were enough red herrings and twists to keep me interested and reading until the very end. If you are a fan of this period, or historical mysteries with a strong female amateur detective, then this series is not to be missed. Historical mystery fans will find a lot to love in Jane Prescott! Free book copy provided by publisher, Minotaur Books, in exchange for an honest review. All opinions are my own and in no way influenced.